As I settle into my new “office” I can’t help but feel a sense of contentment that is altogether new. It’s not a real office, the type that comes in a 40-storey building made of glass and steel, with a million desks and phones with lots of buttons. It’s a home office, 2 desks and a computer tucked in the corner of our new den. I’ve been working from home for 5 years now and I’ve had 3 “offices” including this one. The first was a laptop on a dresser in my bedroom before I was married. When C and I moved in together, I had the whole second bedroom to myself. Now I share the space with our (ok, C’s) tv and shelves of our (ok, my) books. Why does this feel different? Maybe it’s the little trill of permanence (or at least semi-permanence) that I feel in this, our first co-owned bit of concrete space. Maybe it’s the feeling I’ve had since we have moved in, even as the mammoth piles of boxes lay a mess at our feet, that this is really home. Maybe because, no matter how small and pigeonhole-ish, a space of one’s own is truly a magical thing. It’s nothing fancy. As I mentioned, two simple desks, a computer, some shelves, a chocolate brown wall and matching sofa. Above me are my books (and cookbooks) that always manage to make me smile no matter how frenetic the day. Beside me is a window from where I can see the buildings across the street, the busy stream of people going about their business, and most importantly, some trees (a view of green in the city is always something to be relished). The best thing about my little home office though is the unlimited access to homemade lunches like these (well, that and the dress code). – Pound the chicken thigh fillets between two sheets of plastic wrap with a meat mallet until they are a bit thinner and of even thickness. – Mix the flour with the paprika and dust the chicken in this mixture. Shake off excess flour. – Heat the oil in a large frying pan and when hot add the four chicken fillets. Cook over medium heat until the undersides are golden brown. Turn and season the cooked sides with salt. When golden underneath, flip again and season the newly cooked sides. – Put a slice of cheese over each fillet so it more or less covers it completely. 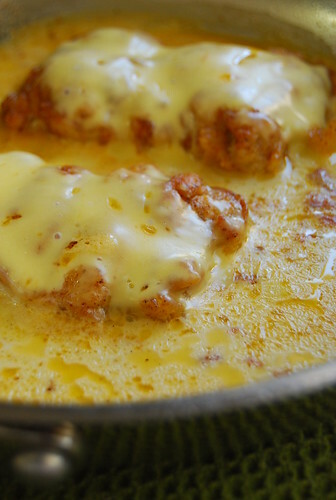 Add the milk to the pan, cover, and cook until the cheese has melted and there is a bubbly, thickened sauce. Make sure the chicken is completely cooked but do not overcook. – Remove from the heat but leave the lid on the pan until just before you serve it so the cheese carries on melting. Serve hot. I’ve mentioned my love for Tessa Kiros before, and for Apples for Jam in particular. This is what Tessa describes as a homely dish. But not in a bad way. It’s gentle and reassuring…like a very familiar hug, or a well-loved blankie. She also says that this is the kind of dish she likes to call her kids down to after their bath…and I imagine I would too. That dish looks so scrumptious! Yummy! Yay for new post ninang! Finally :D.
Great. Now I'm hungry. And I just ate. congrats on the new OWN home office! i worked from home for 3 years but it's not for me. i need people around me lol! but you are right the advantage is most definitely home cooked lunches like these. awesome! Hi Anh! My problem is the opposite! Since my work is right in my home I’m always tempted to check mail after hours and on weekends! Hi The French! Hope you like it! Hi Meeta! Thank you! I know what you mean…sometimes I get stuck in my own little world here…I can go for hours without hearing the sound of my own voice! Homely is *never* in a bad way, in my book 😉 I love how the butterfat just surfaces and seems to say, "Oooh yeah. You want me." This looks way way too good!! How I envy you: I wish I could work at home! (More time for cooking / baking / chocolate-making!) Kudos on the move and the new home office. Your chicken-cheese dish reminds me of this pork and mushroom cheese casserole I posted a while back. Despite the heat, these dishes are still so comforting! This looks divine! Will be adding it our menu next week! Vote for Starry Night by #33 in the Ultimate Sprinkle Contest (link via name). Love Thissa Kirros and there is a similar cretan dish with this… you cook the chicken with your fave yoghurt. Hi Gattina! I know what you mean! Not even to say where we need to stash all the files! Hi Midge! Working at home produces a different kind of stress…sometimes it leaves you less time to do things because it’s so easy to continue working during what would otherwise be considered non-working hours! Also, when the heat is this unbearable I really miss someone else footing the electricity bill 😉 I’m sure mushrooms would be wonderful with this! Hi Sha! Cooked in Greek yogurt…oh my! Sounds divine! Will check out your breakfast post now! That looks mouthwatering. 😀 i love your blog by the way! Now, I can't wait to try this. The title of the recipe itself sounds intriguing and the picture has me drooling! Hi Pixie Cakes! Thank you for a sweet comment 🙂 Glad you like it! Hi Veron! It's simple but oh so comforting…hope you like it! I can see the Tessa Kiros love is universal ;-D this is one of the recipes I want to try out. Is so simple yet so marvelous. I think I will prepare this for diner tonight!. In fact, I love the whole book. Hi Heidi! Yes, she is so easy to love 🙂 I love this book too and read it over and over, heehee! It seems to have a calming effect on me 🙂 Hope you like this! Ooohhh…that looks sooo yummy and comforting! The oil floating on that sauce glistens in just the most come-hither way. I would SO have to eat that with rice, or maybe potatoes (though rice sops up sauce much better). And it sounds really simple to make. I'm just always nervous about cooking chicken, because how do you know when it's cooked through, without cutting it open? heyyyy I just made this but i used havarti cheese instead. Oh and make sure u switch to a clean pan when u do the milk part cus the taste of oil with milk is gross. Thanks for the tips Nathan 🙂 Glad you enjoyed it! I tried this recipe for dinner and it was so good! My husband loved it! I never write replies, but this was so simple and delicious that it would be absolutely wrong for me to not do so. Thank you for this recipe, it was amazing!